The central narrative of the recent floods in Ireland and Britain is based on the severe weather. In fact a number of changes have happened that have contributed to the failure of flood defences. But all this changed with the creation of the Environment Agency in 1997 and when we adopted the European Water Framework Directive in 2000. No longer were the authorities charged with a duty to prevent flooding. Instead, the emphasis shifted, in an astonishing reversal of policy, to a primary obligation to achieve ‘good ecological status’ for our national rivers. This is defined as being as close as possible to ‘undisturbed natural conditions’. ‘Heavily modified waters’, which include rivers dredged or embanked to prevent flooding, cannot, by definition, ever satisfy the terms of the directive. So, in order to comply with the obligations imposed on us by the EU we had to stop dredging and embanking and allow rivers to ‘re-connect with their floodplains’, as the currently fashionable jargon has it. The upshot is that rivers now hold less water because they are shallower. This drastically increases the risk of flooding. The failure to dredge is not a new issue. The burning and draining of grouse moors upstream from towns in Yorkshire including York and Hebden Bridge. This issue was explored by George Monbiot in the Guardian Newspaper. In 2002 Walshaw Moor, a 6,500-acre grouse shooting estate upstream of Hebden Bridge, was bought by the retail tycoon Richard Bannister. 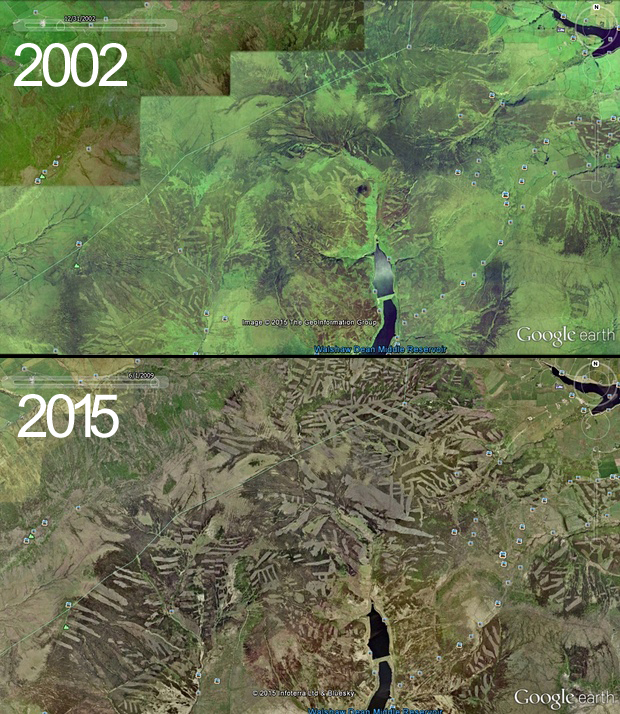 Satellite images before and after [right] show a transformation of the land: a great intensification of burning and draining. These activities raise the number of grouse, which in turns raises the amount (running into thousands per person per day) people will pay to shoot them. When one destroys the vegetation on the moors and at the same time improves the drainage, any rain that falls rapidly makes it's way into the major water ways. With the kind of heavy rain that we have been experiencing in the last two weeks this means flash floods as the banks of the rivers are over-topped. It appears that the government has collaborated in this, or at least not acted to prevent it. For several years campaigners in Hebden Bridge have been begging the government to stop the drainage and burning of the grouse moors upstream. 3. Cuts to spending on the construction of flood defences. Finally as left-wing commentator Owen Jones explains, also in the Guardian, that the government has cut spending on flood defences in order to contribute to "living within our means" as the Chancellor puts it. As official documents now show, the government’s own advisory board recently pointed out that a lack of funds would leave northern communities at risk of floods. One £180m floods defence project was scrapped in Leeds, for example. By failing to improve flood defences the government has allowed this crisis to happen. Instead of spending the money on prevention they are now spending it on mitigation. And if they can find it now, then why could they not find it before? Part of the reason is that it shifts the risk to the public sector. Also the government gets no credit for getting it right. If flood defences work there is no news story. Disasters make the news, disasters averted do not. Thus, rather cynically, the government gets more credit for flood relief than for flood defence, and most of the costs of the disaster are born by insurance companies, whereas only the government contributes to flood defence. Unfortunately people who were flooded last year are now unable to get insurance. So who pays for the damage? Jones segues into a more general critique of the government's response to climate change. They have cancelled subsidies for green alternatives to energy production and let the contract for building a nuclear power station to the Chinese rather than investing in local businesses. So yes, we are having extreme weather at the moment. But the government has not taken appropriate action to prevent flooding, indeed it has been negligent and recalcitrant in taking the actions necessary to prevent exactly the kind of disasters that have wrecked this Christmas for many people in the North. This is the problem with ideologically driven policy. It ignores reality and legislates on the basis of a fantasy world. It's important that we place the blame for the failure of flood defences where it lies - squarely with the government. The previous government are certainly complicit, but the current government have made things considerably worse. For an alternate view on the best approach to flooding see this article in today's Independent (via @Sciamanoinglese). The approach of a town called Pickering, North Yorkshire adopted an approach to flooding that slowed rain's passage from surface to waterways using a series of "leaky" dams. They built 167 leaky dams of logs and branches – which let normal flows through but restrict and slow down high ones – in the becks above the town; added 187 lesser obstructions, made of bales of heather and fulfilling the same purpose, in smaller drains and gullies; and planted 29 hectares of woodland. And, after much bureaucratic tangling, they built a bund, to store up to 120,000 cubic metres of floodwater, releasing it slowly through a culvert. Note however that the second point above the clearing of grouse moors is still problematic. Pickering partly alleviated their problem by planting vegetation. On the grouse moors the drains are designed to rapidly deliver rain to the larger waterways. Pickering took the opposite approach with their leaky dams, slowing the progress of water so that they avoided the flash floods than inundated other towns in Yorkshire. What is interesting about this is that it is a much cheaper that modern flood defences which are often in the form of solid barriers, which work well up the point of failure and then fail catastrophically. The system used in Pickering could fail more graciously because less was riding on any one structure - distributing the flood defences upstream rather than focussing efforts on the flood plane itself demonstrates an important principle when it comes to defending against natural processes. A nuanced discussion of the pros and cons and applicability on a larger scale follow. A rare case of some well researched and presented journalism.